I was surprised to see just how far baby activity centers have come in just the last two years since our youngest son was a baby. I was very impressed with the innovative Bright Starts “Around We Go” Activity Center which has the seat on the outside and allows your baby to cruise 360 degrees around to all the various toys on the activity center table. I have to admit that I was very proud that I assembled this by myself. I usually turn over the building of anything to my husband but I wanted to see if it was something that I could do and I did it! The instructions were easy to follow and in less than an hour the “Around We Go” was ready for action. What amused me the most is that as I was putting away the box and came back into the room my three young children and my husbandwere playing with all of the neat features and having a great time…it was quite a sight. Bright Starts “Around We Go” has won numerous awards and is currently nominated by SheKnows.com as a 2010 Parent’s Choice award. My favorite feature is that this is designed for use for babies and toddlers giving you the most for your money. 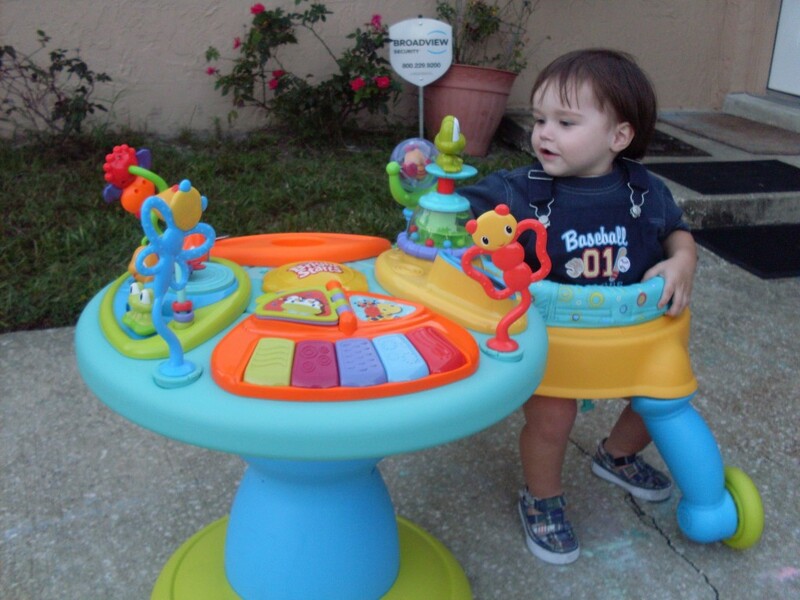 As your baby outgrows the seat, it can be turned into an activity table for toddler play time. Our neighbor’s 17 month old son stopped by and his eye immediately caught the “Around We Go”. As soon as he sat down in it he started to play the piano and listen to the fun songs. Once we showed him just one time how he could move the seat around by himself to get where he wanted to play…he was off on his own. He played quite a bit with the frog popper toy with beads (my favorite) and enjoyed the spinning balls and bendable bugs. He continued to be engaged with all the bright and cheerful toys and played until it was time for him to go home. 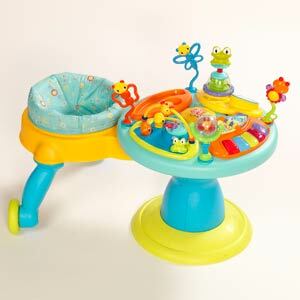 The activity table also has a removable snack tray which is easy to clean, mirror and spinning dragonfly. Bright Starts has an ever growing assortment of the highest quality baby and toddler toys including over 100 activity centers, bouncer, swings and playards and play gyms to chose from. The “Around We Go” would easily be my “go to” baby shower gift because it is not just innovative but affordable too. Bright Starts “Around We Go” is available at major retailers including Target and retails for $79.99.